On a brisk autumn night in 1998, 85-year-old Angie Genova grabbed her bowling bag and purse and set out on foot for her bowling league. Though the bowling alley was a half-mile from her home in suburban Waltham, Mass., the mother of nine and grandmother of more than 20 had little trouble navigating the way. When Angie arrived at the Wal-Lex Recreation Center, she tried the doors and found they were locked. So she waited. And waited. And after a while, the tiny white-haired woman walked home and called her family to ask where everyone was. It was 4 a.m. That’s when her family knew for sure: Angie had Alzheimer’s disease. Lisa Genova ’92 was fresh out of Harvard University with a Ph.D. in neuroscience when Angie, her grandmother, was diagnosed. She knew the science behind the disease, how neurons in her grandmother’s head, not far from her ears, were being strangled to death. But as she witnessed her Nana go from an active, vibrant woman to a person who couldn’t recognize her children and was unable to find the bathroom in her own home, she wondered: What does it feel like to have Alzheimer’s? All good scientists, the ones who help the field think in an entirely new way, are storytellers. Telling a story about Alzheimer’s from the perspective of a person with the disease sounded like a good idea for a novel, Genova thought. But she didn’t seem like a likely person to write it. She was a bench scientist turned healthcare consultant. Science was all about empirical evidence; fiction was all about creativity. What did she know about writing a novel? “Nothing,” she says, laughing. Despite this, Genova went ahead and wrote Still Alice, the fictional story of Alice Howland, a cognitive psychology professor at Harvard University who is diagnosed with Alzheimer’s disease at the age of 50 and struggles with her loss of memory and independence. She self-published the book through iUniverse in 2007. A year later it caught the attention of Simon & Schuster, which published it in January. Since then Still Alice has been a fixture on The New York Times Best Seller List and transformed Genova into not just a best-selling author but an Alzheimer’s advocate who travels the country speaking about the disease. At Bates, she self-designed her major in biopsychology and considered a career as a college professor. Genova never took a writing class, but she was a gifted writer who could communicate clearly and effectively. She also knew the importance of telling stories, especially when it came to science. By high school, Genova knew that she wanted to be a scientist but wasn’t comfortable with her intelligence, so she tried to hide it. “Being smart wasn’t cool at Waltham High,” she explains. When she got to Bates, she took a look at her bright, engaged classmates and realized she had nothing to hide. “For the first time I felt absolutely comfortable in my own skin,” says Genova, who graduated with Phi Beta Kappa membership and was ranked first in her class in 1992. That sense of confidence made a lasting impression on Professor of Psychology John Kelsey, Genova’s adviser at Bates. Genova — who also has extensive acting experience — just signed a two-book deal with Simon & Schuster. She is currently at work on her second novel, Left Neglected, the story of a woman who suffers a traumatic brain injury, to be published in 2011. Genova may have left the lab bench behind, but her storytelling will always have neuroscience at its core. At least for now. “What I believe, without hesitation, is that I’m not the best writer in the world by any stretch of the imagination,” she says. “What I have is a background and a passion for neuroscience, so what I can do is illuminate stories and show people a view of a certain kind of world that they normally don’t have access to. 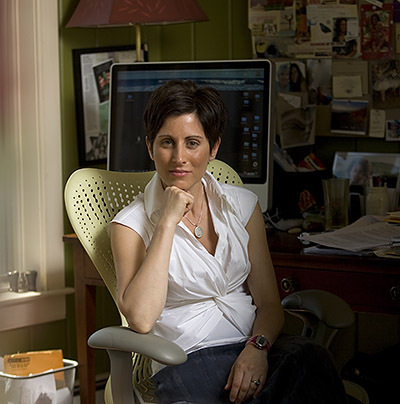 Freelance writer Maria Blackburn is a former writer for Johns Hopkins Magazine and reporter for The Baltimore Sun.